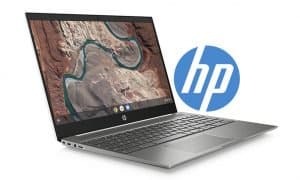 As Chromebooks become increasingly popular, more options are becoming available for users wishing to purchase a light, portable, mobile computing solution. 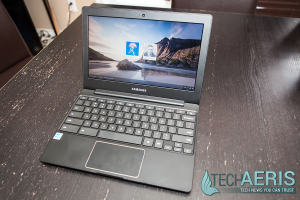 Samsung has updated their original Chromebook with the Samsung Chromebook 2 and we had a chance to test drive the 11.6-inch model for a few weeks – read on for our Samsung Chromebook 2 review. 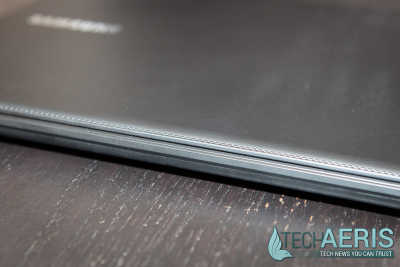 The stitched faux leather lid adds a touch of class to the look of Samsung’s Chromebook 2. Upon opening the box and looking inside, my initial impression was how good it looked with Samsung’s faux leather lid. The finish gives it a classier business look and feel to it, and at a glance it looks like a leather folio sitting on a desk. The keyboard has a nice feel to it, the keys have a slightly rounded edge to them and are nice to the touch. I did find the keyboard a bit small for my larger hands, but the more I used it the less I found myself making mistakes in typing. 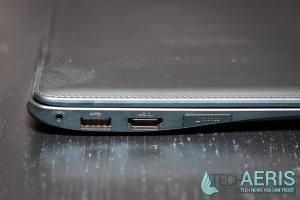 The touchpad consists of a single rectangular pad, and there are no left or right buttons on it. To perform a single or double click, simply tap on the touchpad. To perform a right click, you can either tap the touchpad with two fingers, or hold down the alt key while tapping the touchpad. Personally I would have preferred having two buttons near the bottom of the touchpad but after awhile the single finger and two finger tap became second nature. The top row of function buttons make access to the most used options easily accessible and include forward and back, refresh, full screen, brightness and volume controls, as well as the power button. The Chromebook 2 itself is pretty small in size – just under 11.5″ x 8″ and just over 1/2″ thick, which makes it great for portability. 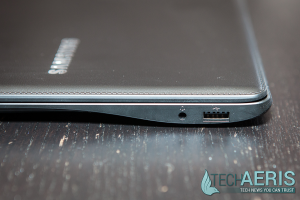 Even though the Chromebook 2 is fairly light – weighing in at 2.65lbs – it still feels solid when used. The display is pretty much what one can expect from a smaller form factor, the LED HD screen is anti-reflective which makes it viewable from pretty much any angle. The brightness on the display can be adjusted from fairly bright to almost black, even in a pitch black room I found the lowest setting to low. I’m not sure anyone would have a use for such a low setting, but at least it’s there so you can adjust the brightness to your liking – no matter what the surrounding light conditions. The screen is veiwable from almost any angle, and the colors are decent. Even thought the resolution is slightly above 720p, videos looked crisp and the colors were very decent as well. Text is readable, but not quite as crisp as some other displays – but by no means unreadable. Screen angle also seems to affect this a bit and I found when the text wasn’t as clear as it should be, a simple adjustment of the screen angle made it better. Not expecting much in the way of sound from such a small laptop, I was mildly surprised at the quality of sound in both video and streaming music from Google Play Music. There isn’t much bass but it doesn’t sound tinny as is often the case when there’s not lot in the way range on the bass end of the equalizer spectrum. Powered by Samsung’s Exynos 5420 CPU running at 1.9GHz and a 16GB eMMC hard drive, the Samsung Chromebook 2 boots up – and reboots – very quickly. ChromeOS is lightweight as it is, and I was able to have a number of things running – 4 or 5 tabs open in Chrome while streaming Google Play Music and syncing Google Drive – without feeling like I was taxing the system. Battery life is always a concern with laptops, especially the smaller ones where users often take them places where they have limited access to plugins. 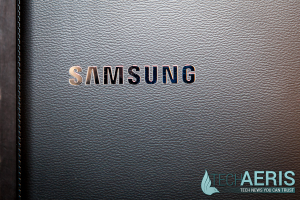 Samsung states that the Chromebook 2 gets up to 8 hours on a single charge, and I was seeing between 6 1/2 – 7 hours while doing your average tasks including word processing, browsing the Internet, and streaming music. I usually break out the software and ecosystem separately, but because this is a Chromebook, it comes with ChromeOS and there’s not much to say about that – people buy Chromebooks knowing they run ChromeOS. As far as the ecosystem goes, you are limited pretty much to the Google ecosystem tied to Google Drive and Google Docs, but there is a plethora of apps and games available through the Chrome Web Store. These apps range from productivity, to media streaming and customization options. While the $319USD price tag is on the higher end for similarly sized Chromebooks, the Chromebook 2 comes with double the ram as most of those around the $200-$240 range. An extra $50-100 might seem a bit steep for doubling up on the RAM but having 4GB as opposed to 2GB – and a faster processor – will make a big difference in performance and will ensure your Chromebook remains usable for longer. 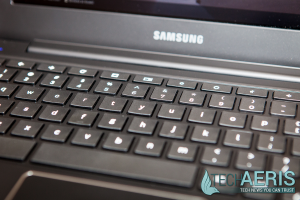 Overall the Samsung Chromebook 2 performed well, with decent color and sound for an 11.6″ laptop. 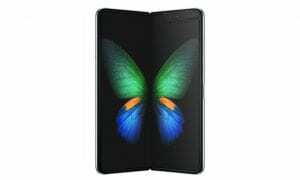 As mentioned above, having 4GB of RAM is definitely nice and I am really fond of the leather folio look of Samsung’s offering. 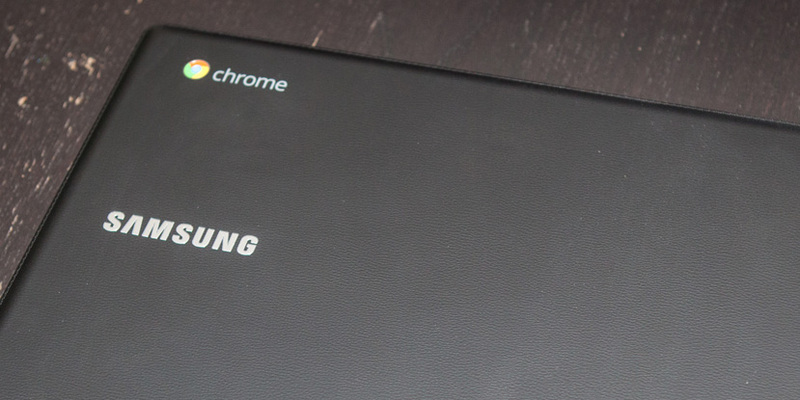 If you’re looking for a small, portable Chromebook with enough battery power to last you the day, you should definitely add the Samsung Chromebook 2 to your consideration list. Great looking Chromebook with the leather lid, good battery life. Screen could be a bit crisper when it comes to text, touchpad buttons would be a nice addition. 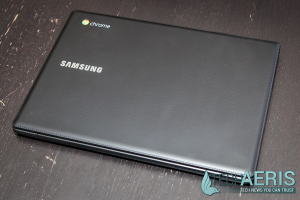 If you're in the market for an 11" Chromebook with a classier look, you can't go wrong with the Samsung Chromebook 2.